Sunday in Montreal was oppressively hot, so humid the air felt wet. My mom and I spent the afternoon going to thrift shops on the West Island. There are 3 Nova Stores in our area. Nova is an organization that provides nursing home care services in Montreal. To raise money they have thrift stores around the city. Run by volunteers, often retired nurses, they sell everything from furniture to fabric remnants. I could spend hours in those stores. And there’s no need to feel shopping guilt because all for a great cause. My goal today was to find props for photos, and I did; antique bowls, 25 cent glasses, and a tiney tiny silver spoon. I also picked up a copy of Anne of Green Gables for $1, just because I love that book. But the best find of the day was a teak chair for $35, very similar to this one. It needs to be reupholstered, but still an amazing deal. I can’t wait to start searching for fabric for it! The drive from store to store is a very pretty stretch of road along the water. We had the windows rolled down enjoying what the summer has to offer. By the time we got home we were quite parched. Thankfully I had this Nectarine and Basil Iced Tea waiting for us. I was a little hesitant to add the basil, but it actually gives the tea a really nice almost spicy flavour. It was surprisingly refreshing. I kept the iced tea alcohol free, but feel free to booze it up. Steep the tea in 8 cups boiled water for 5 minutes, then discard the tea bags. While the tea is steeping, bring the nectarine slices and sugar to boil with 1 cup of water. Reserve 1/4 of the nectarine slices. Simmer for 10 minutes, then turn off the heat and add the basil leaves to the pot for 5 minutes to flavour the syrup. Discard the leaves and pour the nectarine mixture into the tea. 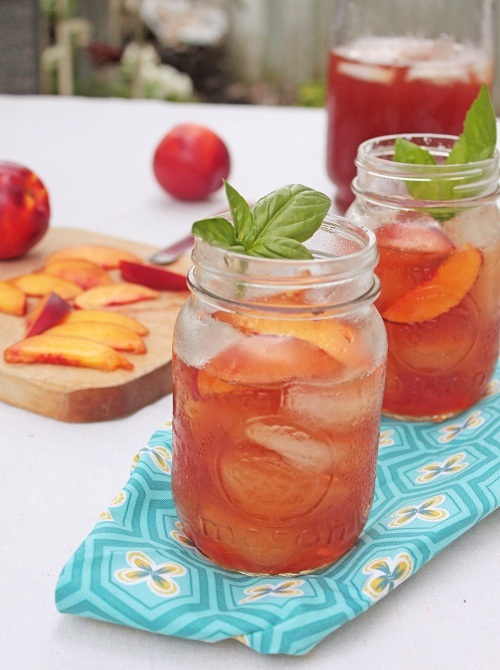 Chill, then serve with ice and remaining nectarine slices. Very interesting combination of flavors. i’d have to try to to see what it tasted like. I could only imagine. Sounds lovely! I’ll have to give this a try before the summer is out! A day of prop shopping and iced tea, yes please! These colors are SPECTACULAR. Just lovely. 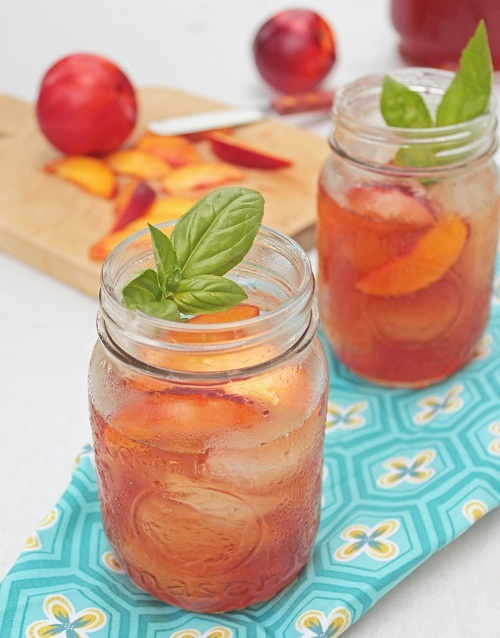 There is something so right about iced tea in ball jars. Love it! I love Anne of Green Gables too, can’t wait until my girls are old enough for me to read it to them! Shopping for props is so fun, and it would be great to come home to this iced tea! Perfect summer tea! This looks so delicious! I love all the flavored iced teas out there. This sounds amazing! This is brilliant! And it looks so refreshing! I’m definitely going to be trying this one day! And I’m so jealous you are in Montreal! I miss the food there so much!! !